Hero Histories: Fear...the Fantom of the Fair! The first science fiction convention (NyCon 1) was held on the fairgrounds! Charlie Chan caught a murderer in the Worlds Fair-themed film Murder Over New York ! Doc Savage fought "The Worlds Fair Goblin" in the pages of his pulp magazine! DC Comics launched a book called Worlds Fair Comics . (After the Fair closed, it was retitled Worlds Best, then Worlds Finest) This tied-in with "Superman Day" at the Fair, featuring the first actor to play Superman in costume, Ray Middleton! And a super-hero was created specifically to protect the Fair and fairgoers! 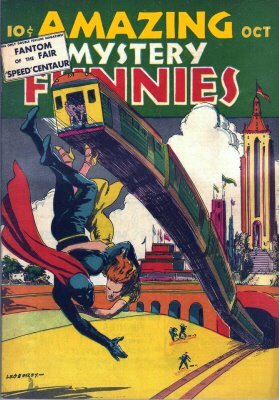 Appearing in Amazing Mystery Funnies, The Fantom of the Fair was dedicated to defending those who walked the grounds of the exhibition, battling evil within it's boundaries. The covers and stories incorporated elements and locales of the Fair. He had above-normal strength and agility, plus the ability to hypnotize people and alter their memories. His face was never revealed. When he wore civilian clothes, his visage was obscured by a fedora. Despite changing his name to FantoMan when he received his own title, and expanding his operations to the whole of NYC, the character's series ended a couple of months after the Fair closed. While he inspired the similarly-named Phantom of the Fair who was integral to the retconned origin of DC Comics' Golden Age Sandman , he hasn't popped up yet in Alex Ross' Project SuperPowers , where most of his publisher's other characters have already appeared. But, it's probably just a matter of time. Meanwhile, the crew at Atomic Kommie Comics™ felt a kool hero like the Fantom should not be forgotten, so we incorporated a pair of his best covers into the Lost Heroes of the Golden Age of Comics™ line, giving him his own section! If you want to show that special pop-culture-oriented someone (who's into Worlds Fair kitch) that you want to share their interests with them, do a 1939 Worlds Fair-themed present! Combine one of our cool Fantom of the Fair collectibles with a copy of a World's Fair-themed book, the Images of America book 1939-1940 NY World's Fair or The Amazing Adventures of Kavalier & Clay by Michael Chabon, or Doc Savage "The Worlds Fair Goblin" by Kenneth Robeson! All titles are in-print and currently available! Then party like it's 1939!